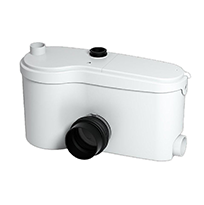 SANIACCESS3® The Saniaccess3 is a system that is used to install a complete bathroom up to 15 feet below the sewer line, or even up to 150 feet away from a soil stack. 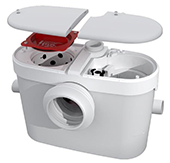 SANIPLUS® The Saniplus is a system that is used to install a complete bathroom up to 15 feet below the sewer line, or even up to 150 feet away from a soil stack. SANIPACK® The Sanipack is a macerator device which is meant to be installed inside a wall cavity in a bathroom up to 15 feet below the sewer line, or up to 150 feet away from a soil stack. SANIACCESS2® The Saniaccess2 is a system that is used to install a half bathroom up to 15 feet below the sewer line, or even up to 150 feet away from a soil stack. SANICOMPACT® The Sanicompact is a self contained system that is used to install a half-bathroom up to 9 feet below the sewer line, or even up to 120 feet away from a soil stack. 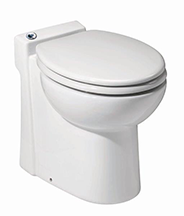 SANISTAR® Self-contained china toilet emulates the European wall-hung toilets. It can be used to install a half- bathroom up to 9 feet below the sewer line, or up to 100 feet away from a soil stack. SANIVITE® Drain pump that is ideally suitable for use in a basement apartment or anywhere in the house where additional fixtures are most wanted. 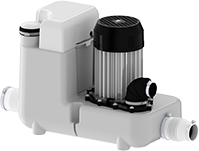 SANISWIFT® Drain pump that is suitable for use in a basement apartment or anywhere in the house where additional fixtures are most wanted. 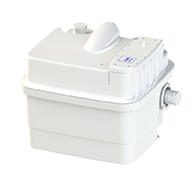 SANICOM1® Commercial drain pump that is ideally suitable for use in a commercial environments, restaurants, or anywhere in a building structure where additional fixtures are most wanted. SANISHOWER® Small drain pump that may be used to pump waste water away from a shower, sink, bar sink, or other fixture. It is small enough to fit underneath a raised shower base. SANIBEST PRO® System that is used to install a complete bathroom up to 25 feet below the sewer line, or even up to 150 feet away from a soil stack. 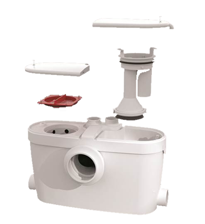 SANIGRIND PRO® System that is used to install a complete bathroom up to 25 feet below the sewer line, or even up to 150 feet away from a soil stack. SANICUBIC1® Pre-assembled heavy-duty simplex grinder pump that meets the demanding needs of commercial and residential sewage applications. SANICUBIC2® Pre-assembled heavy-duty duplex grinder pump that meets the demanding needs of commercial and residential sewage applications. Looking for more jobs? Become a Saniflo Certified Installer! Certified Installers are listed in Saniflo's online directory. Copyright © 2010 - 2018 SFA All rights reserved.